Ready for a website redesign for your photo booth company? Let me help! 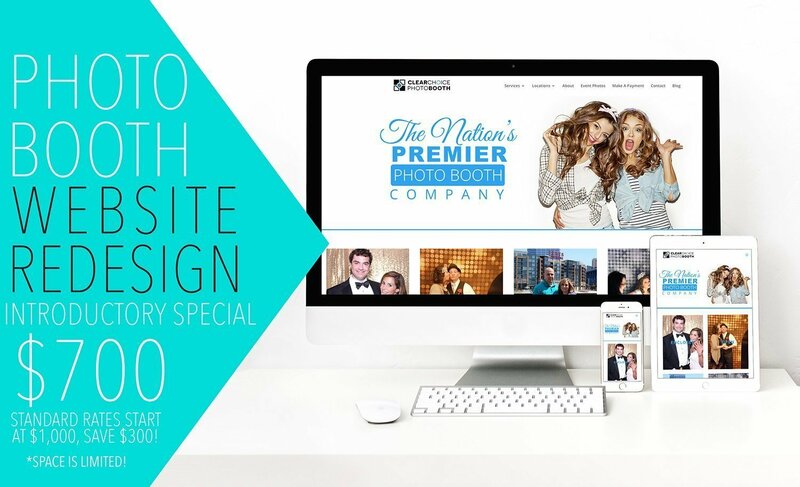 I am offering $300 off my introductory pricing for website design, exclusively for photo booth company owners! That means a brand new, custom website design for ONLY $700! WHY ME? I had the pleasure of working for Clear Choice Photo Booth for nearly four years, and have learned the ins and outs of the fast paced photo booth industry. Unlike other web designers, I know what your potential clients are searching for when they Google photo booths and know how to get their attention! By working for one of the fastest growing companies in the industry, I understand the importance of a clean, modern site while still informing your audience of ALL of the services you offer! WHAT DO YOU GET? A completely customized website design! Yes, 5-7 completely custom pages to fit your company’s needs, branding and services. (If your website has more than 7 pages, you can add on additional pages, also at an introductory price. Alternatively, if all you need is a single landing page, I offer that at a lower price.) During the redesign process, I make sure that important texts & images are search engine optimized to give you a better result on your Google ranking. All of my websites are built with WordPress (though I can work with other systems as well). All designs are responsive and look consistent via computer, tablet, mobile, etc. NEED A NEW LOGO? I do that too! I also design marketing material, ads, and more. Please feel free to message me to discuss! READY TO START? Please fill out the form below to get in touch. If you have any questions at all, please do not hesitate to contact me at [email protected] or via phone/text at 419.602.0556. Because of the introductory price, space is limited! Get your spot today! Please fill out this form and I will be in touch with you within 24 hours!